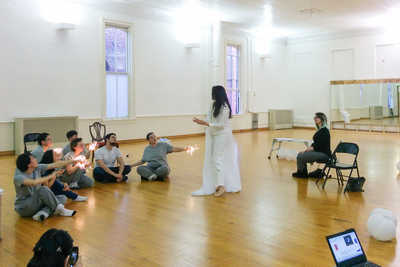 Illinois physics professor Gina Lorenz, center, playing a quantum sage, uses poetry to explain concepts of light in the interdisciplinary performance piece “Quantum Voyages.” It was created by Illinois physics professor Smitha Vishveshwara and theatre professor Latrelle Bright to offer a look at basic concepts of quantum physics. 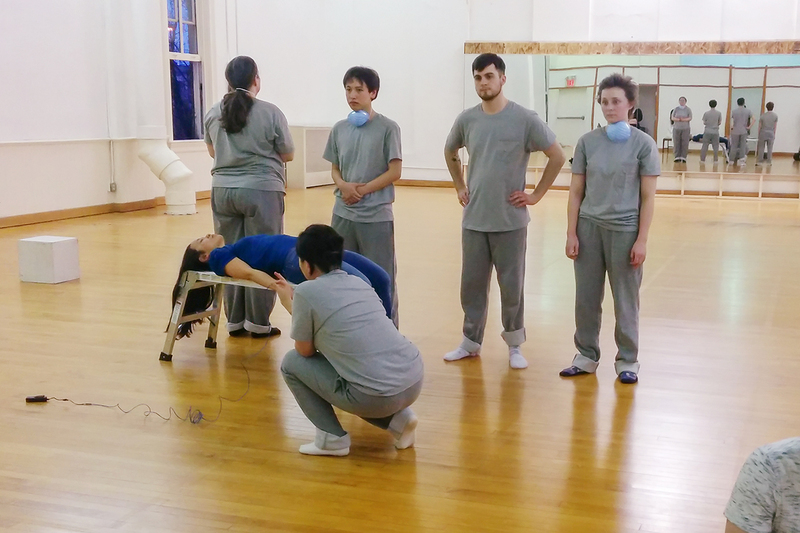 CHAMPAIGN, Ill. — Two voyagers will visit strange atomic landscapes that offer a glimpse of the quantum physics world in “Quantum Voyages,” an interdisciplinary theater piece. The performance piece was created by University of Illinois physics professor Smitha Vishveshwara and theatre professor Latrelle Bright to offer a look at some basic concepts of quantum physics. It will be performed at 7:30 p.m. March 30 at the I Hotel and Conference Center, 1900 S. First St., Champaign, as part of a quantum physics conference celebrating Nobel Prize-winning physicist Anthony Leggett’s 80th birthday, and followed by a public lecture by physicist Matthew Fisher, an Illinois alumnus and a former student of Leggett. “Quantum Voyages” will be performed again at 7:30 p.m. April 4 at the Beckman Institute for Advanced Science and Technology Auditorium. Both performances are open to the public. Vishveshwara and Bright imagined an epic journey through the quantum world, with the two voyagers gathering knowledge and negotiating conflicts with one another. The characters are Terra, representing the earth, and Akash, representing the sky. They are guided by Sapienza, the spirit of knowledge. When the voyagers are stumped by a quantum conundrum during their journey, they consult the sages who appear – five physics professors who play themselves and explain various phenomena. One professor answers questions about photons with a response written in iambic pentameter. Vishveshwara and Bright found a parallel between the properties of certain particles and the relationships between people. “(The voyagers) are depicted as opposites,” Bright said. In a scene from “Quantum Voyages,” the character Terra lies inside an MRI machine, surrounded by actors depicting the machine’s magnets and the medical staff. Terra and Akash have an exchange explaining what happens to water molecules and magnetic protons within the body as it is in the machine. The actors in “Quantum Voyages” are University of Illinois students, faculty members and staff, as well as community members. They are initially friendly, representing the characteristics of bosons, or particles that can occupy the same quantum state. When they are at loggerheads, they represent fermions, which cannot occupy the same quantum state. And in the end, they are brought into harmony by pairing, as electrons do inside superconductors to exhibit traits of friendly bosons as pairs. “It’s this lovely journey of seeing the light, opening our eyes to all the possibilities, and exploring quantum states of matter, accompanied by deeper relationships forming among the characters and their understanding of the physics,” she said. Vishveshwara seeks to make the world of quantum physics come alive for people in diverse ways as with the study of the universe. “The quantum world is this dazzling, mighty world, and as with the cosmos, it warrants being depicted in fascinating, mysterious and yet accessible ways,” she said. Vishveshwara, who studies condensed-matter physics, is a big fan of theater and of the arts in general. Her father also was a physicist and, as a planetarium director, scripted shows and worked with visual artists and musicians, sparking an interest in theater in his daughter. She recently joined the faculty of Beckman Institute, with one of the purposes being to grow collaborative science-art explorations. Bright’s specialty is devised theater – finding out about a particular topic (such as quantum physics) and using its theatricality to turn it into a show. She loves science, and she sat in on a class Vishveshwara created, Where the Arts Meet Physics, to learn about the physics of water for a piece about water. Editor’s notes: To reach Smitha Vishveshwara, email smivish@illinois.edu. To reach Latrelle Bright, email lbright@illinois.edu.